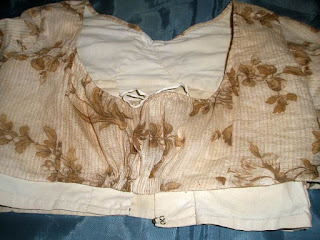 The one thing I have trouble with is making pretty undergarments for my gowns. 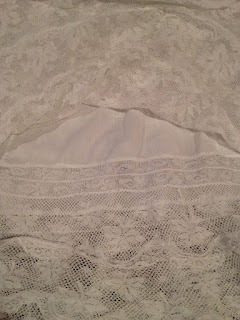 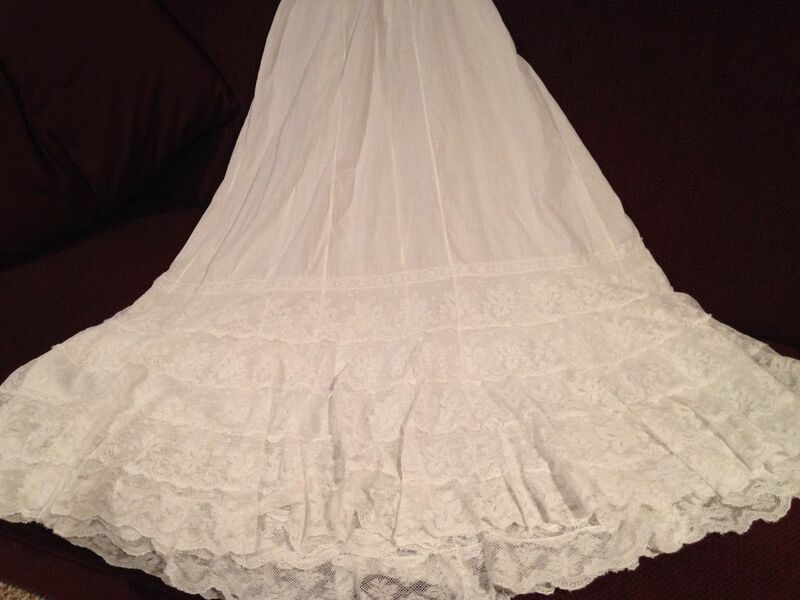 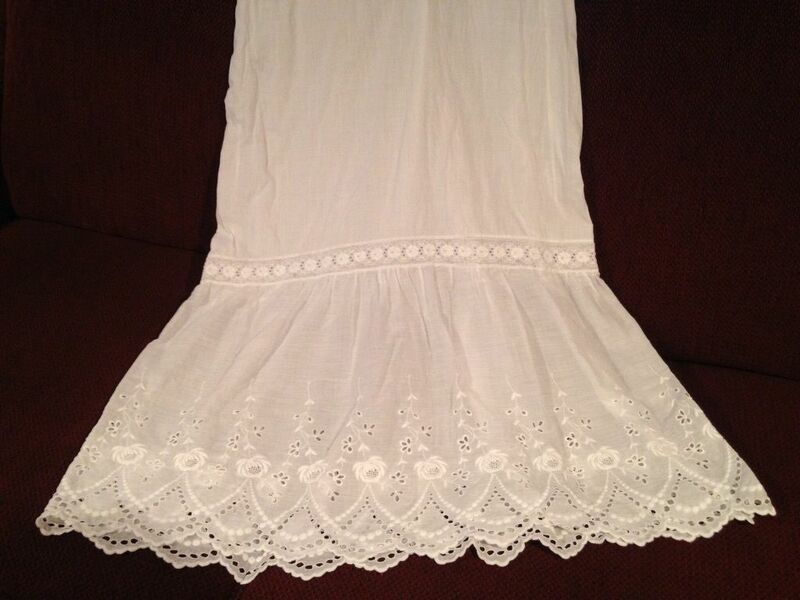 This is why I love the second petticoat slip so much! 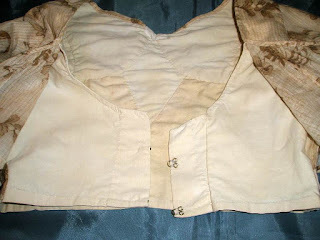 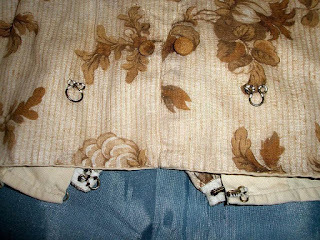 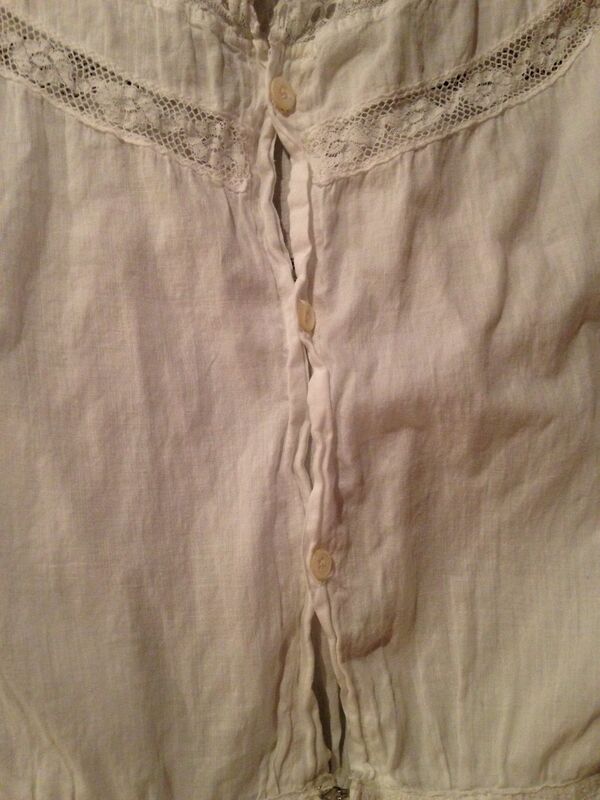 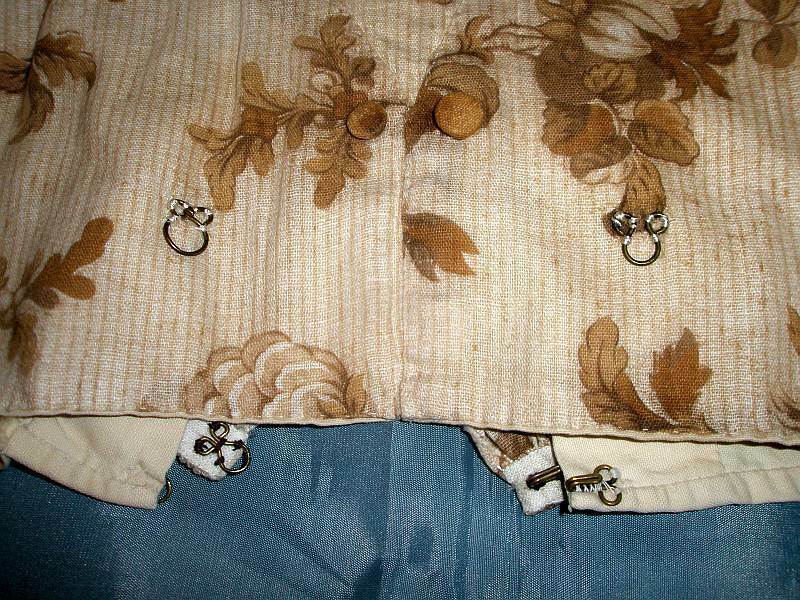 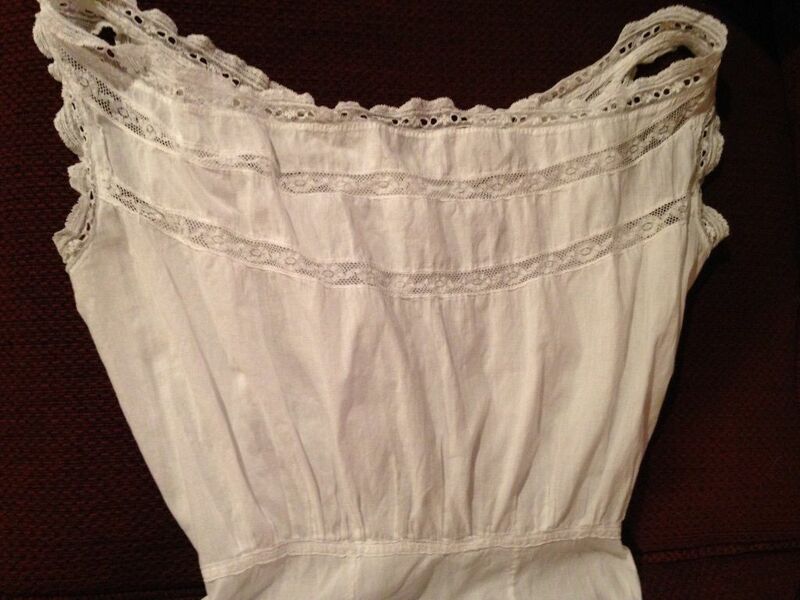 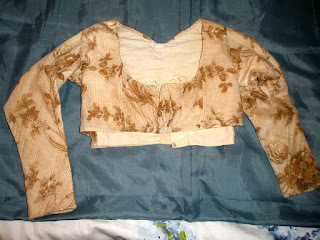 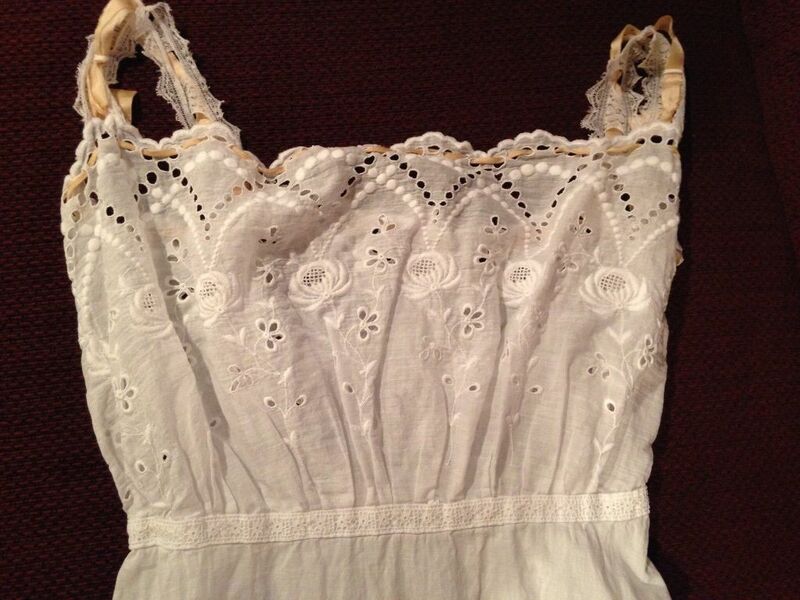 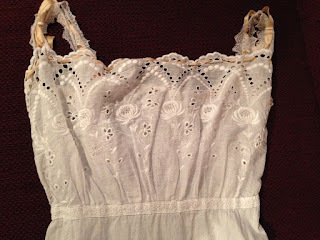 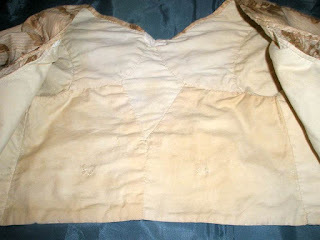 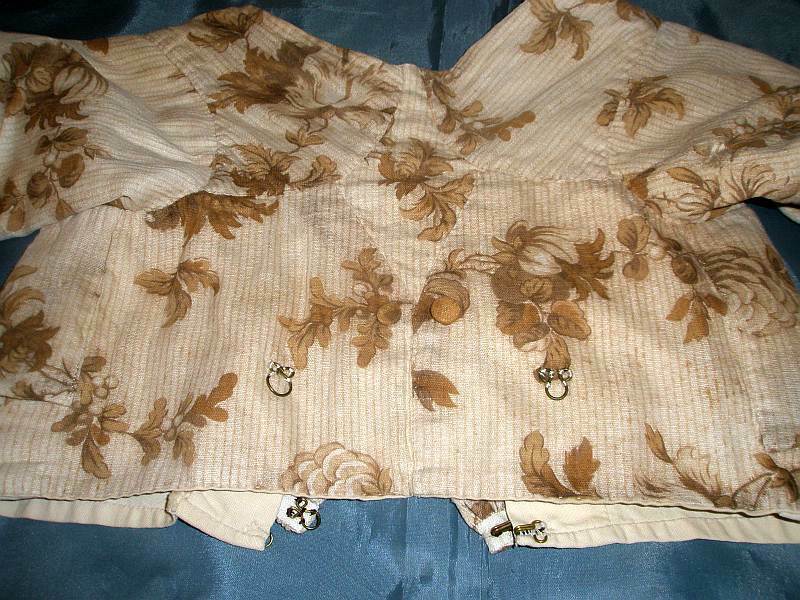 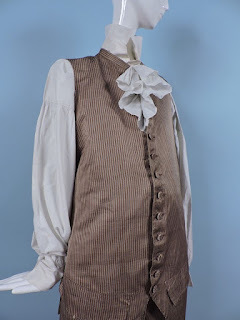 Look, she used the petticoat hemming to make the bodice! And then left over lace for the straps! 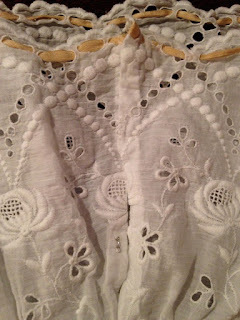 So easy and yet so lovely. 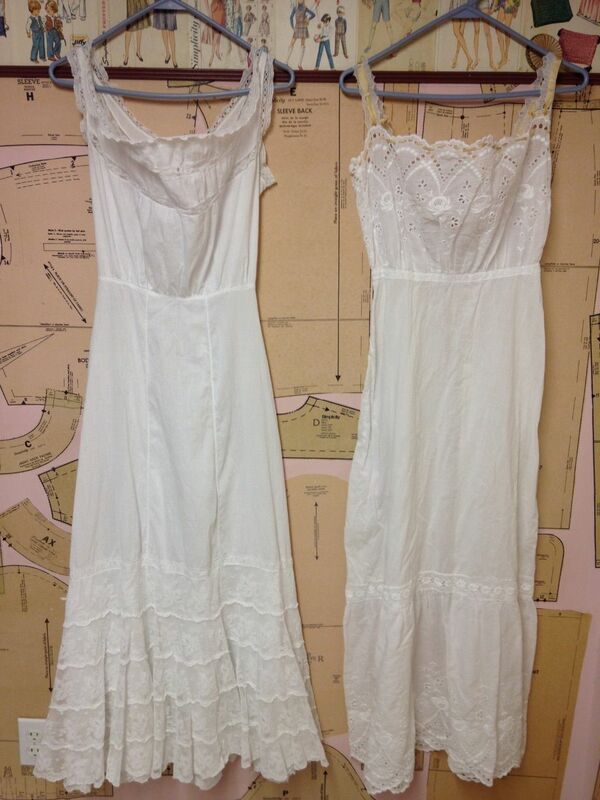 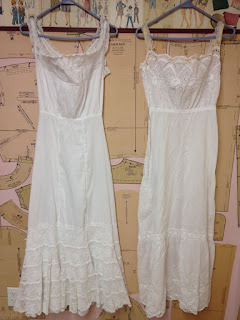 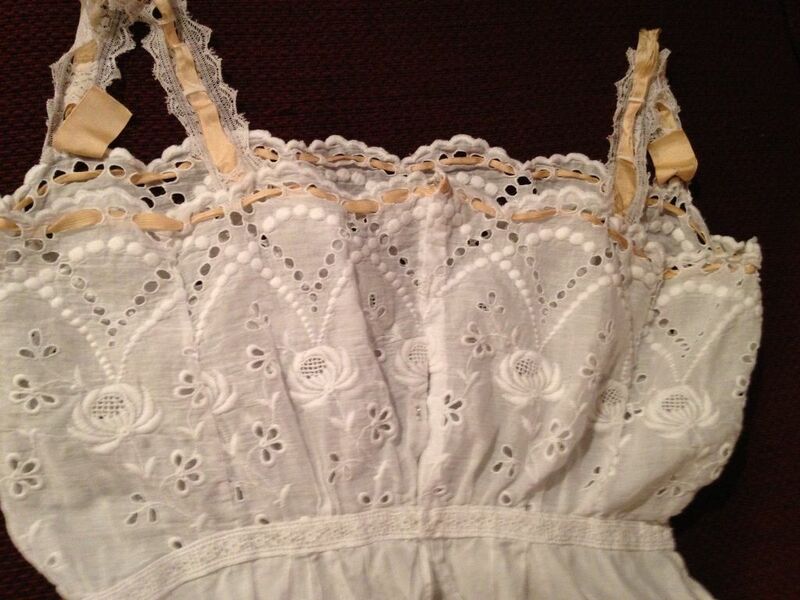 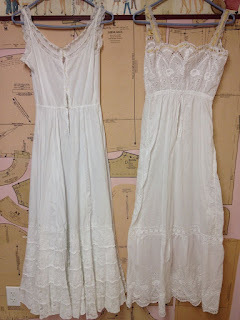 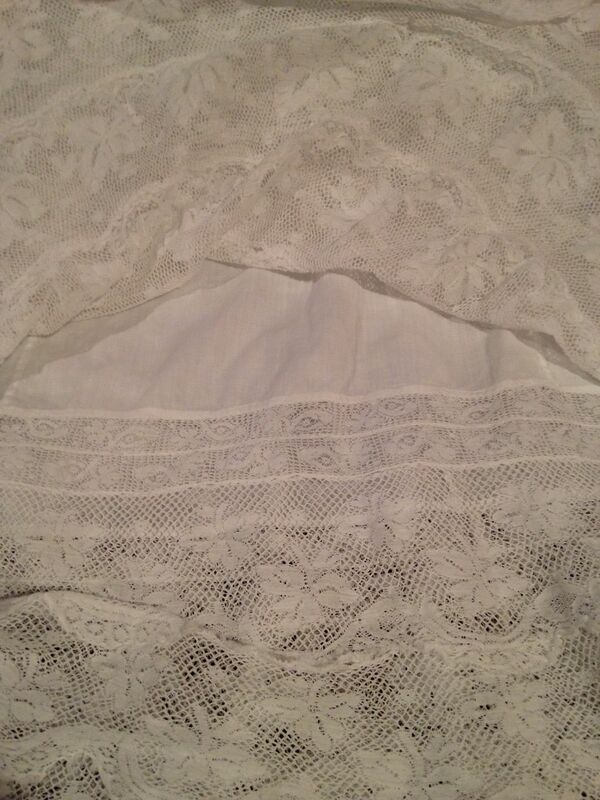 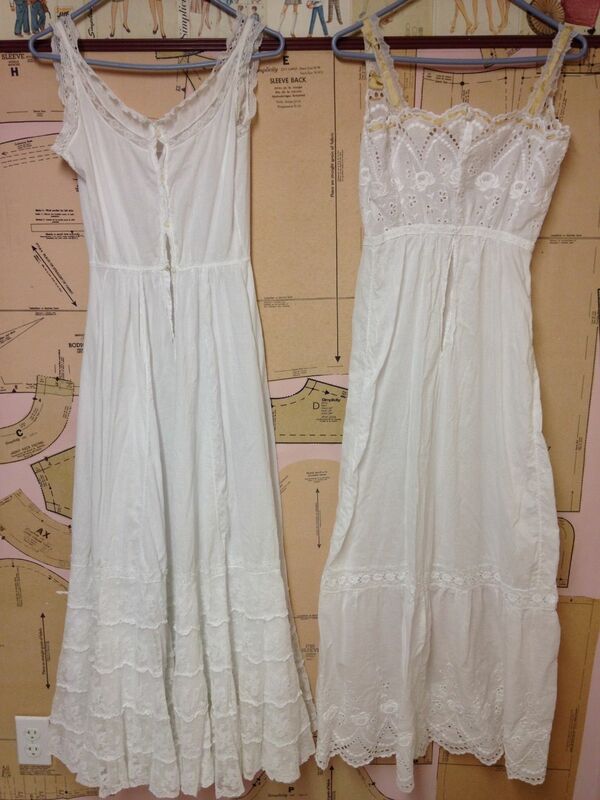 The Victorian one is very much 1890's (all that lace!). 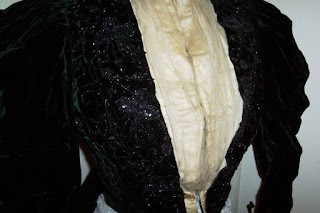 The Edwardian one is late Edwardian going into early Teens era. 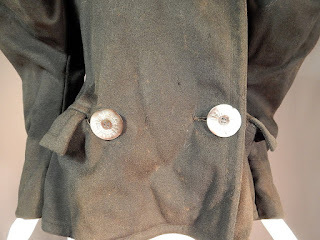 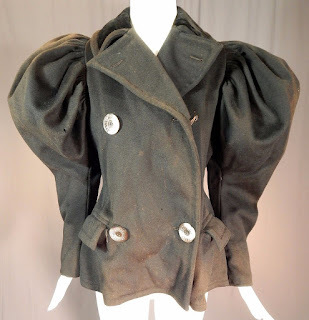 This antique Victorian era black wool womens winter sportswear ice skating mutton sleeve coat dates from 1890. 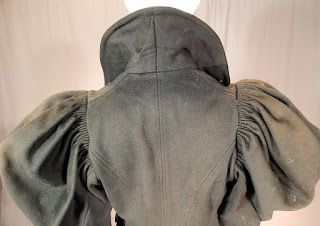 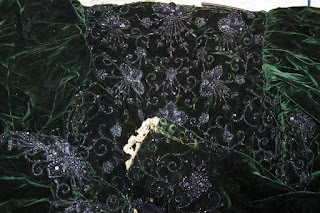 It is made of a black heavy wool fabric. 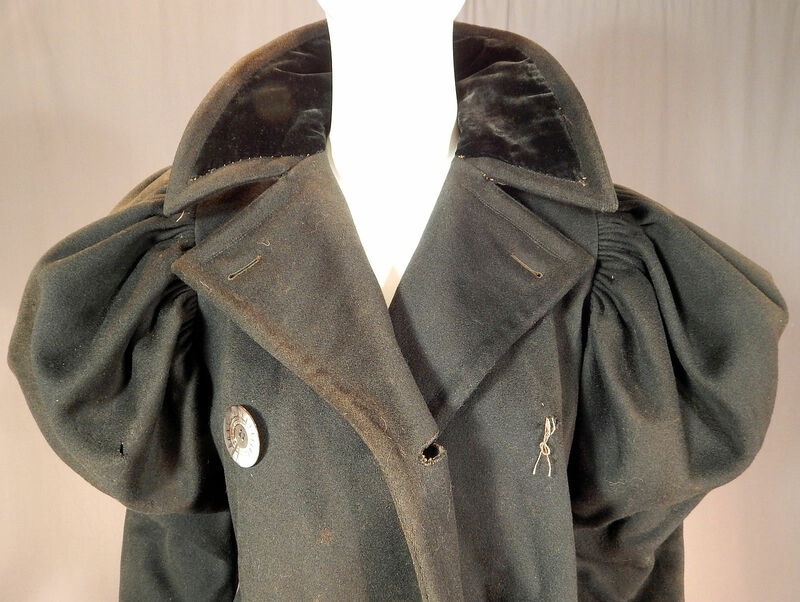 This wonderful womens winter sportswear ice skating coat jacket has a short mid length fitted tailored style, with leg of mutton gigot style long full sleeves voluminous on the upper arm and tapering down to a tight fit cuff, double breasted carved mother of pearl button front closure, side pockets, a fold over lapel collar with velvet trim decorative stitching accents and has remnants remaining of the original black silk lining inside. 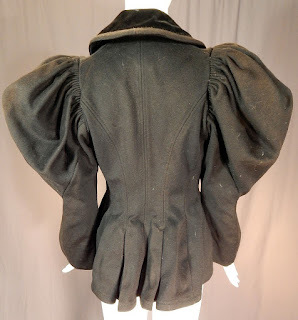 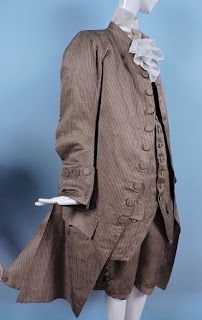 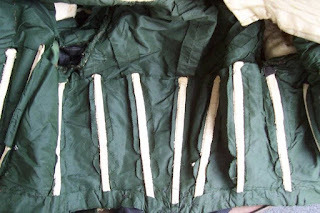 The coat measures 25 inches long, with a 38 inch bust, 28 inch waist, 25 inch long sleeves and is 11 inches across the back shoulder seam. It is in fair as-is condition, has not been cleaned. 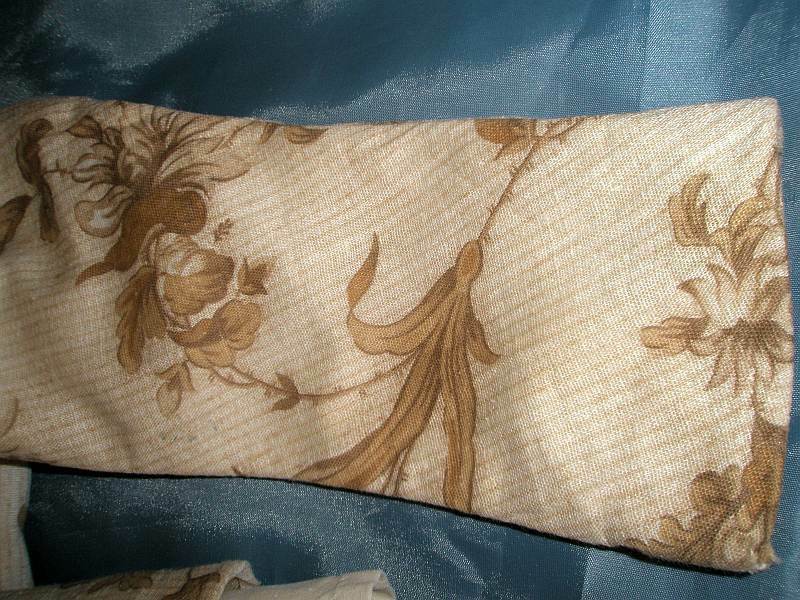 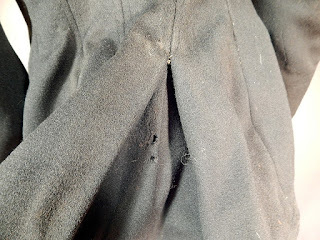 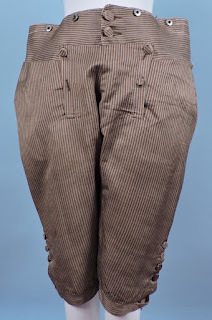 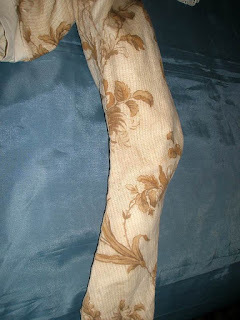 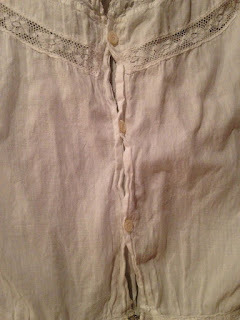 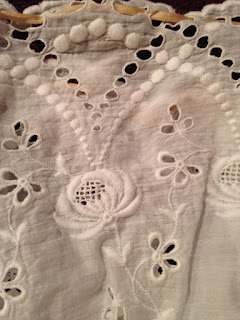 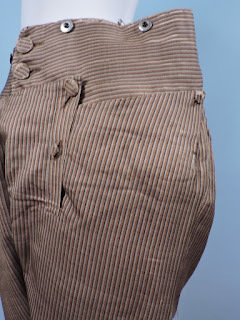 has several small stains, slight fade discoloration in areas, frayed inside lining, is missing a mop button and has several small moth holes scattered in areas (see close-ups). Great for design, display, study or pattern. 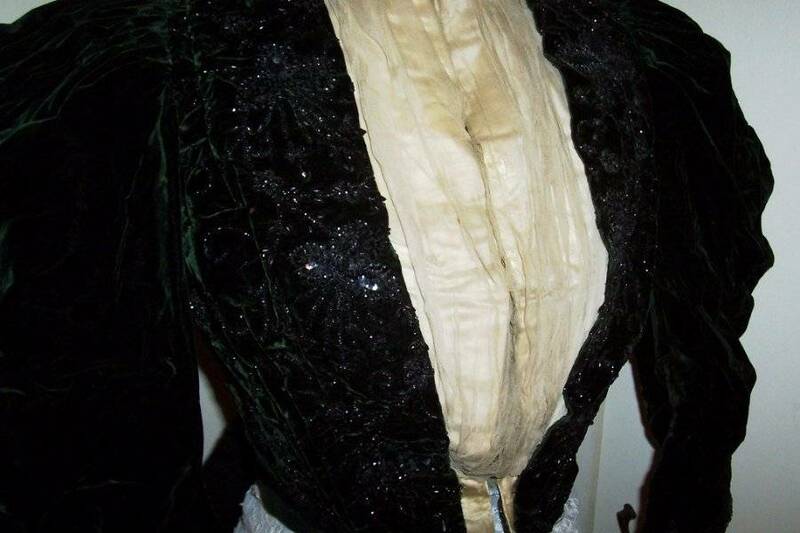 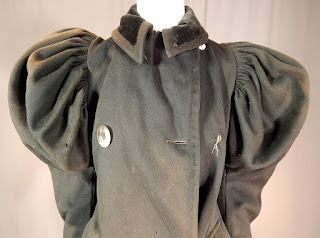 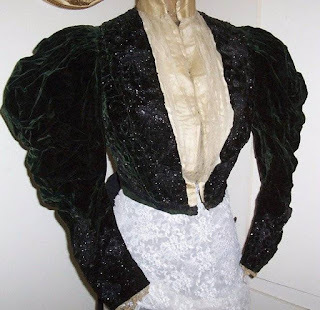 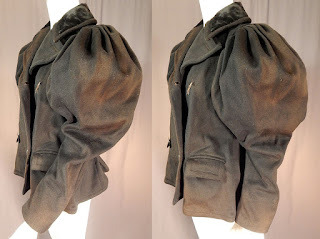 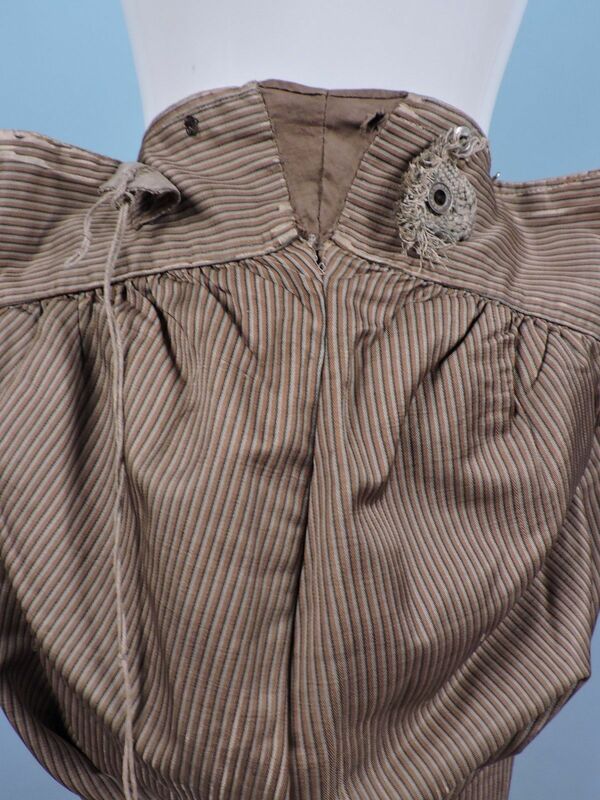 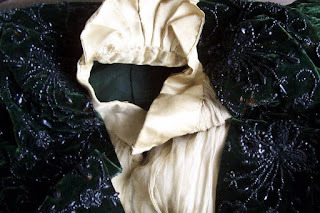 This is truly a rare and unique piece of antique Victoriana womens sportswear wearable art! 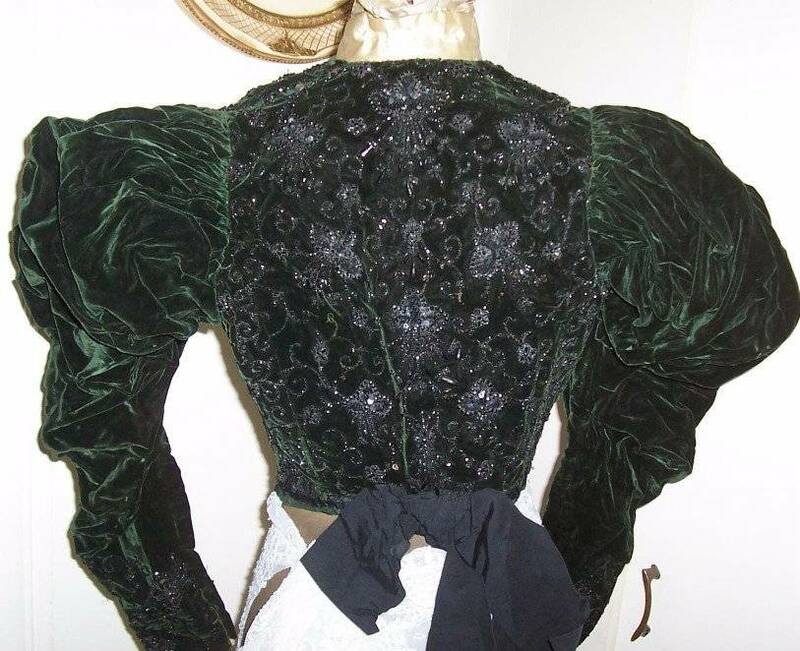 It dates from the 1890's not 1890 - there is a big difference there. Drives me nuts when people do that. 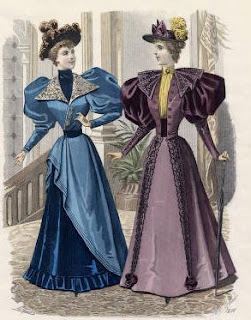 1890 is a year - technically still a part of the 1880's. 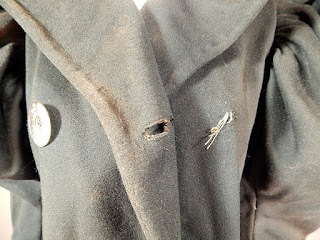 There was no year zero. 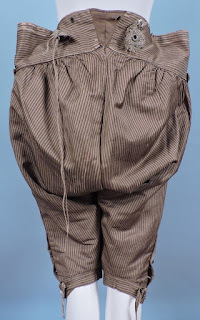 When a monk during the "dark ages" decided to set up the calender we all now use, he was using his Roman math - the zero hadn't been introduced or used in the Western world. That would happen a few centuries later. 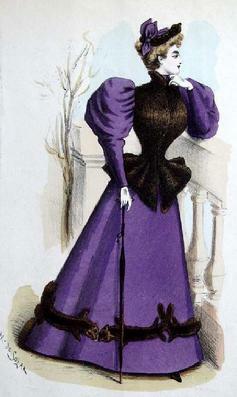 1890's is a decade. 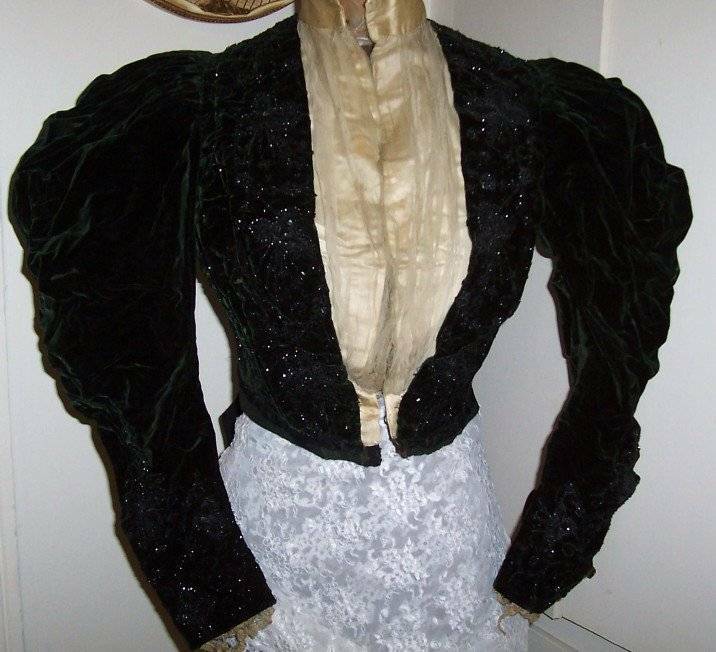 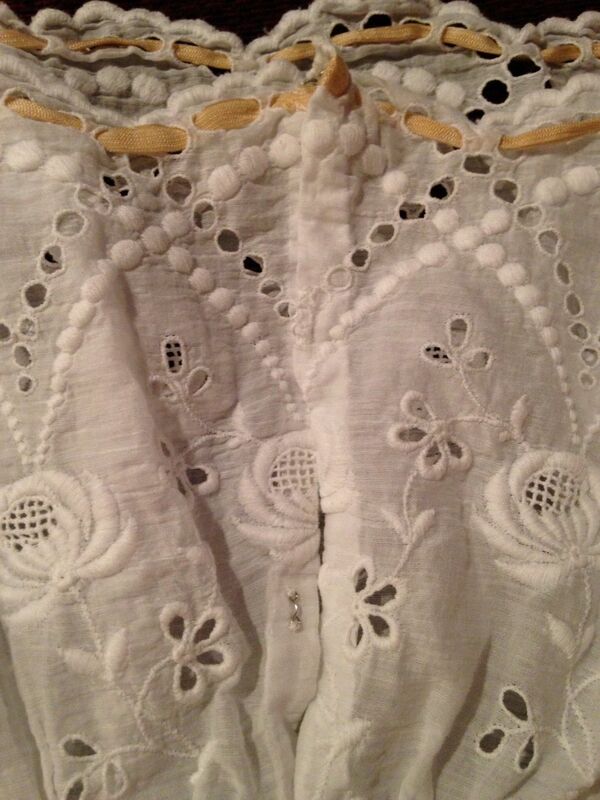 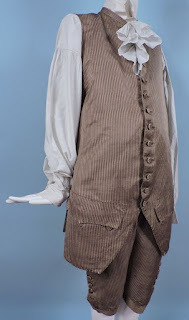 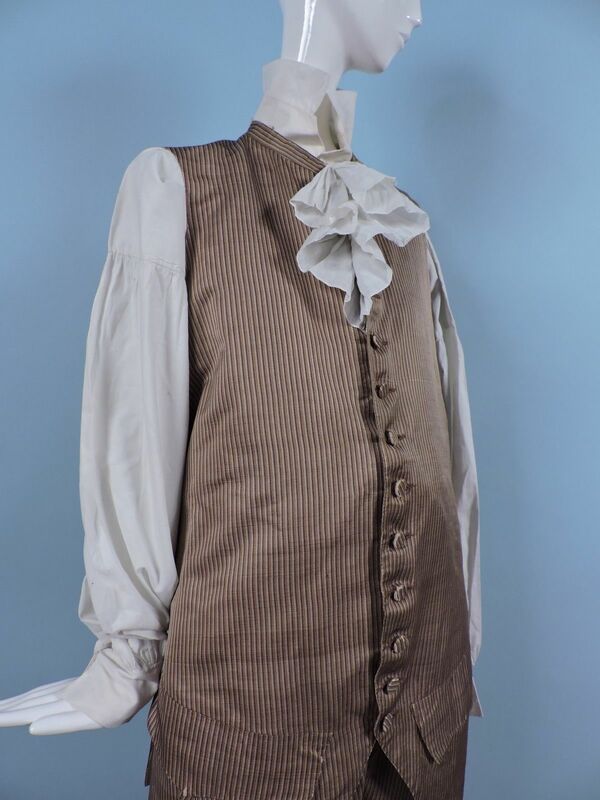 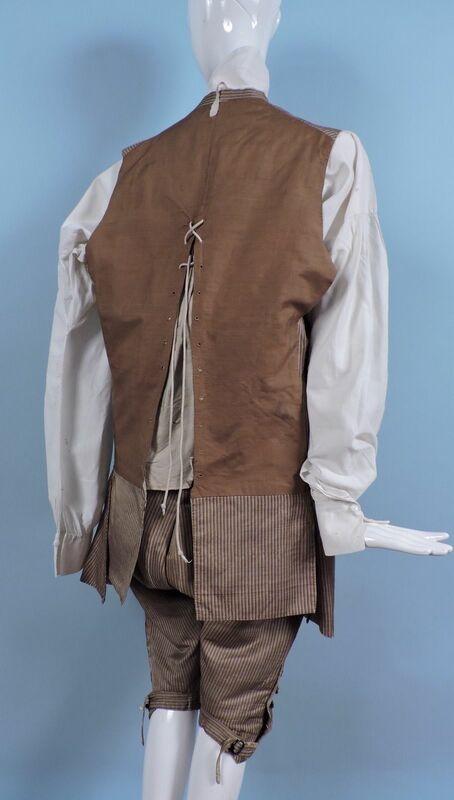 This jacket is not from 1890, it is from the 1890's. 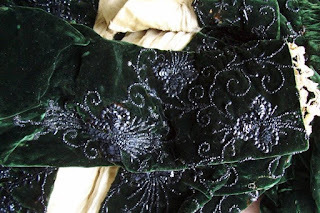 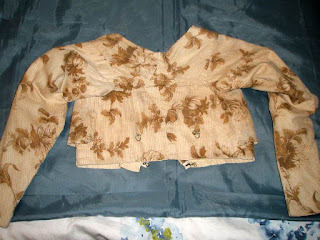 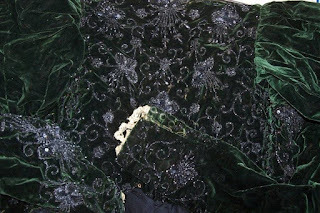 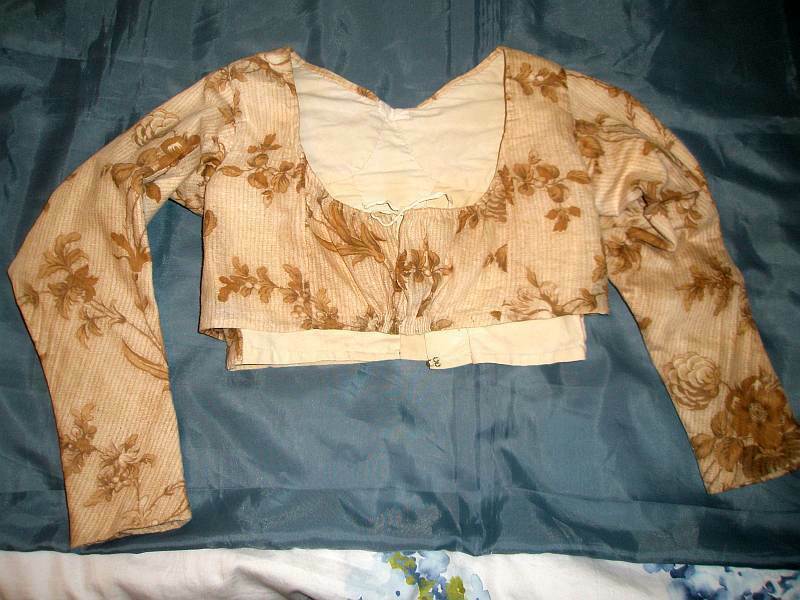 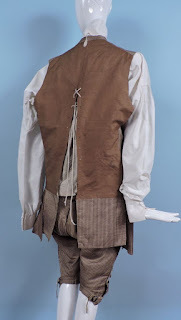 The jacket is most likely from 1893/1894.